There is no mountain range in Montenegro that can compete with all the other Montenegrin ranges, but is at the same time so less frequent visited, even by the most well-known mountaineers and hikers, such as Bioč. Maybe the most important reason for that is the fact that Bioč is not so rich with water springs. Also, the climbing of each peak on Bioč is a whole-day route. Together with mountain ranges of Maglić, Volujak and Vlasulja, Bioč create a beautiful mountain area with many high peaks, beautifully lakes, valleys and plateaus. From all of them, Bioč is the highest one with its Veliki Vitao (2397 m) peak. Bioč is also the highest mountain range in the northwest part of Montenegro. 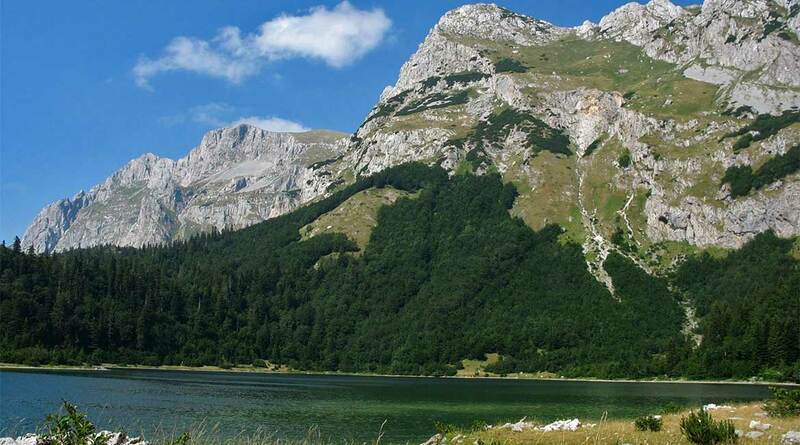 Bioč range stretches between the Stabanska Jezera lakes on the south, Pivsko Jezero lake on the east, Mratinje valley on the north, and is connected with Maglić, Trnovački Durmitor and Volujak mountains. Bioč mountain has a specific, unique and chaotic outlook and its wildness is the main reason of its impressive beauty. Most impressive group of the peaks in Bioč are Vitlovi peaks, specially their north side which you can see from one very special point, placed 1 km north from Veliki Vitao. That amazing point is called Bubreg (2339 m). In the Bioč massif which is long and wide about 10 kilometers are placed a lot of another impressive peaks. Bioč range is not so rich by green plateaus and water springs. Precisely, it is very difficult to find water. The highest peaks of Bioč massif are surrounded by rocky glacial cirques. Some mountain writers called that area “Rocky Desert”. Peaks as are Veliki Vitao, Mali Vitao, Bubreg, Vrsta and Nož with their impressive and sharp vertical cliffs will make an impression. Bioč range is not good known and popular like neighbor Durmitor range, but in any case that range deserve full attention and respect. Veliki Vitao and other highest peaks of Bioč range visit just a real mountain devotees, good knowers and special mountaineers. Bioč massif is fine decorated by two beautiful lakes, Veliko Stabansko Jezero lake at 1325 m (300 m long, 190 m wide, maximum depth of 10 m) and Malo Stabansko Jezero lake at 1194 m (in summer it is 160 m long, 150 m wide, 4.5 m deep) in the Stabna Valley where is Bioč separate from Lebršnik and Volujak.